Hammer toes may be effectively corrected in different ways. Treatments can be non-invasive and involve physical therapy along with the advice that the person not wear any more shoes that restrict appropriate space for their toes. Appropriate shoes for people who want to avoid hammer toes, or for people who already have them, should be at least half an inch longer than the person’s longest toe. High-heeled shoes are something to definitely avoid. The technique the surgeon applies during the surgery hammertoe depends on how much flexibility the person’s affected toes still retain. If some flexibility has still been preserved in their affected toes, the hammer toes might be corrected through making a small incision into the toe so the surgeon can manipulate the tendon that is forcing the person’s toes into a curved position. If, however, the person’s toes have become completely rigid, the surgeon might have to do more than re-aligning the person’s tendons. 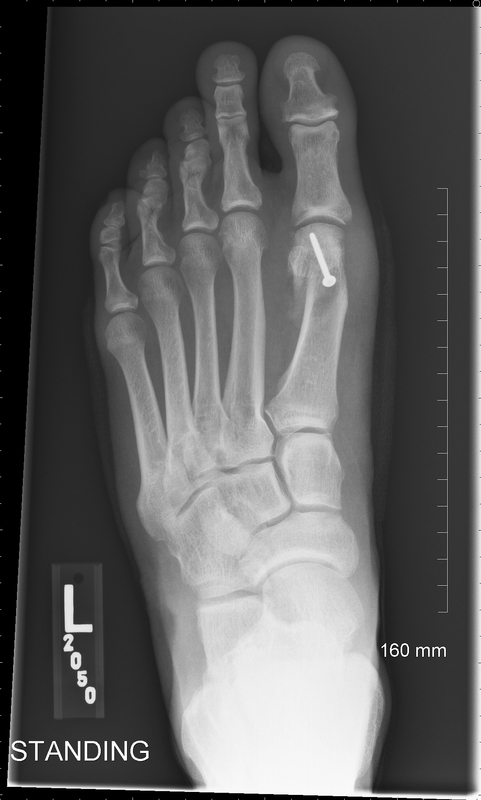 Some pieces of bone may have to be removed so the person’s toe has the ability to straighten out. If this is the case, some pins are attached onto the person’s foot afterwards to fix their bones into place while the injured tissue heals. Bunions occur most often on the side of large toe, mainly caused by wearing tight shoes that shove the big toe toward the other toes. This creates a deformed appearance to the toe as it is forced to confine itself to accommodate tiny foot space. High heels and narrow pointed shoes are leading culprits to accumulating painful bunions. Bunions can become swollen, inflamed and irritated if left untreated, and become unsightly as the condition worsens. Following are some foot care tips that can help to protect your feet from infections as well as keep them healthy years down the line. A hammertoe is a deformity that occurs when a toe is permanently bent downward or sideways. The affected toe (often the toe next to the big toe) has an unnatural bend in the middle joint. The biggest cause of hammertoes is wearing high heels or shoes that are too tight in the toe box. These types of shoes crowd the toes together, pushing up toes to create space. Over time, toes that have been crowded can become permanently stiff. This is because the tendons have contracted and tightened after being persistently crowded over a period of time. It’s a good idea to go in to see your podiatrist when your toes begin to take on that hammer-like or clawed appearance, especially if you’re finding it painful to walk because of the condition. Your podiatrist will likely make the diagnosis by examining your foot visually, and may test the joint for flexibility and pain. He or she may also suggest X-rays in order to get an insider’s look at what’s going on in your foot. Most hammer toes occur in the “lesser” toes (the second, third and fourth toes); it’s rarely seen in the big toe. Medicine Net defines hammertoe as a common deformity of the foot in which either the second, third, or fourth toe is bent at the middle joint, so that the tip of the toe is bent downward while the middle of the toe is cocked upward resembling a hammer. The hammertoe deformity is the most common deformity of the small toes. A bunion is a deformity where a bony lump protrudes outside the foot. It causes the displacement of the foot’s first metatarsal bone. It causes the big toe to move towards the rest of the toes. Bunions cause intense toe pain and make finding shoes that fit very difficult. Some toe straighteners are designed to offer maximum correction but are lightweight enough to be worn in shoes. Supported on the underside of the foot, the toe straighteners mould closely to the sole of the foot and are unnoticeable in most shoe styles. These work by positioning the toes in the correct place and allowing the feet to adjust naturally to the new position. There are a number of common foot pain causes and most of them are caused due to fashion oriented footwear. People are more focused towards wearing footwear that is trendier while ignoring the important facts that describes the common foot pain causes.